Mumbai India’s skywalks have been a symbol of poor planning for the city, but with public engagement and key design initiatives, the skywalk still has the potential to increase access for the residents of the city. Photo by TheMumbaiflyover/Flickr. 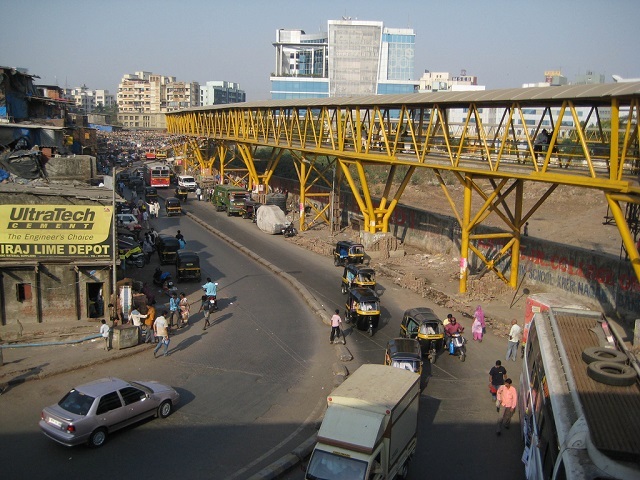 Mumbai, India’s skywalk project was meant to provide better connectivity and accessibility for pedestrians in the city. The project – a joint initiative of the Mumbai Metropolitan Region Development Authority (MMRDA) and the Maharshtra State Road Development Corporation (MSRDC) – aimed to build a target of 50 skywalks with a pricetag of USD 123 million. The goal was not only to build the world’s largest skywalk network, but also to shape Mumbai as an innovative leader in urban planning among developing cities. Due in part to poor planning and a contractor-driven agenda, the skywalks are now largely a blight on the city. Yet, the project’s failures also serve to illuminate the path forward. With human-centred design and public participation, these skywalks can become the tools to increase sustainable mobility that Mumbai’s planners envisioned and that citizens deserve. There was originally huge enthusiasm in the media for Mumbai’s skywalks – they were seen as solutions for a healthier, more active lifestyle, calming traffic, and fighting pollution. Thirty-seven skywalks rose around the city over the course of the past five years. Yet a survey conducted by the Mumbai Transformation Support Unit revealed that only one or two major skywalks were attracting pedestrians. The MMRDA called off further construction of the skywalks amidst growing dissent over the once glorified project. In an interview given to the Times of India, Vasai legislator and activist Vivek Pandit dubbed the skywalk project a “contractor driven project” with hardly any public outreach and little research behind the locations and safety of the skywalks. The Times found that only 1% of pedestrians use the skywalks for commuting, which was thought to yield the highest economic return for the project. Dissent surrounding the skywalks only increased following public availability of data on the project’s safety. According to a recent survey published in the Hindustan Times, 63.2% of people said the skywalks were not safe for women, especially at non-peak hours. 42.6% felt they were unsafe for everyone, with 81.4% going so far as to say that there needed to be full time security. Other issues emerged, such as skywalks being constructed too close to residential buildings and creating privacy issues for residents; in other places, construction was delayed by as long as four years and caused persistent traffic congestion in the surrounding communities. Some of the issues with the skywalk were more subtle, such as there being no visible signboards for first time users. Lack of services, such as escalators and ramps, also made it difficult for the mobility-impaired to access the skywalks. Can the skywalk be saved? Strategic placement of skywalks around metros and airports to connect and integrate transport modes. Partner with local vendors to occupy areas around the footpaths to drum up foot traffic—increasing safety and helping local businesses. Any project that seeks to bring long-term sustainability to an urban area requires public engagement, particularly as these projects are taxpayer-funded and citizens are the ultimate users. Indian city dwellers are beginning to question the infrastructure that their cities are providing them, and they are growing ever more resolute in asserting their needs. For Mumbai’s skywalks and beyond, Indian citizens have made their demand for safe, connected cities and the sustainable mobility they deserve.